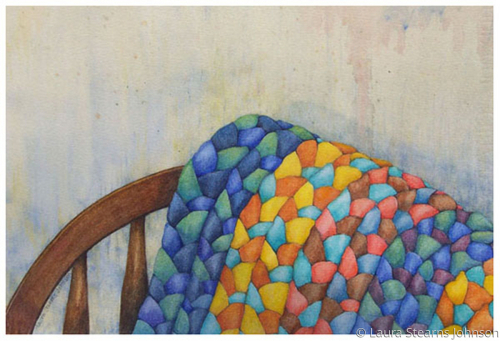 The original watercolor has been sold. Prints are available. 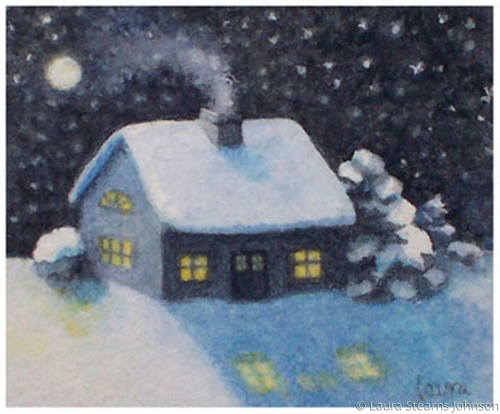 This tiny painting looks great in a circle, square or rectangular mat. 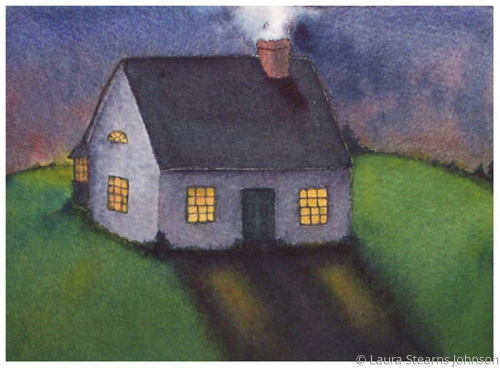 Original watercolor painting NFS. Prints are available. 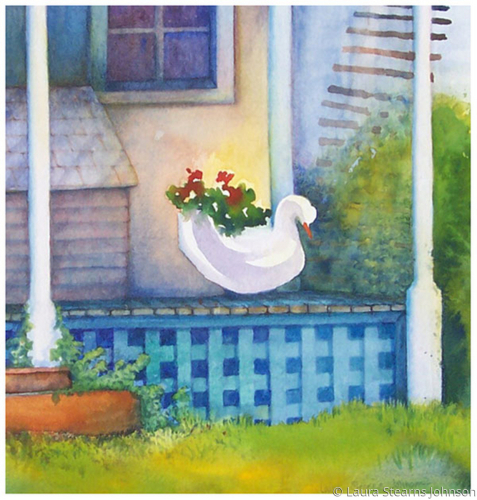 The beautiful golden light of a sunset is captured in this unique painting of a quaint New England porch. 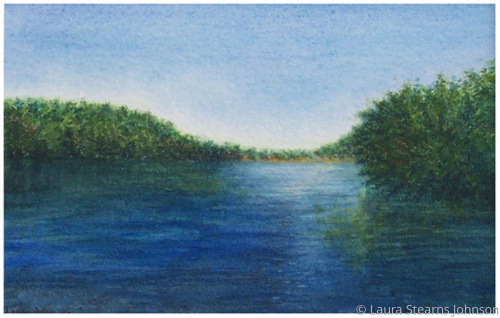 Original watercolor painting is available with optional white, deep mat and/or gold metal frame. Prints may be available upon request. I am very proud to have inherited my mother's favorite doll, Annette, a reproduction of one of the famous Dionne Quintuplets. In this painting, I have captured her sweetness, complete with missing shoe, as she sits contentedly on a shelf in my bedroom along with some of my favorite antiques and vintage items and nasturtiums from my garden. Original painting not for sale. Prints or note cards may be available upon request. Original painting has been sold. Prints may be available upon request. 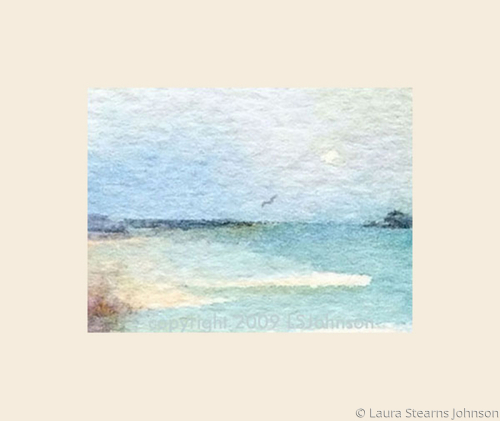 This tiny beach scene is just one of those little miracles that happen sometimes with watercolor; one of the reasons I love watercolor so much! The original painting is not for sale. Prints are available. Both my Nana and my husband's Nana made braided rugs. They seem to last forever and are still in use today in our home and in our siblings homes. The original painting has been sold. Prints or note cards may be available upon request. This was a fun little illustration to do. 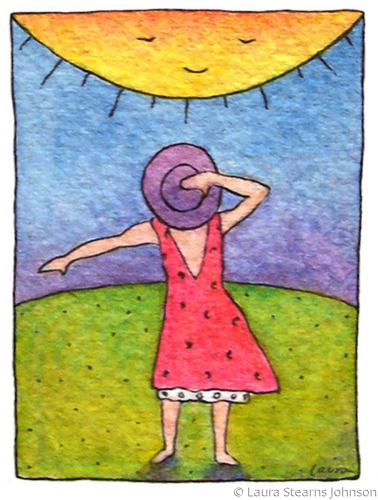 It depicts how I feel when I am happy and all is right with the world. The original pen and ink with watercolor has been sold. Prints are available upon request. 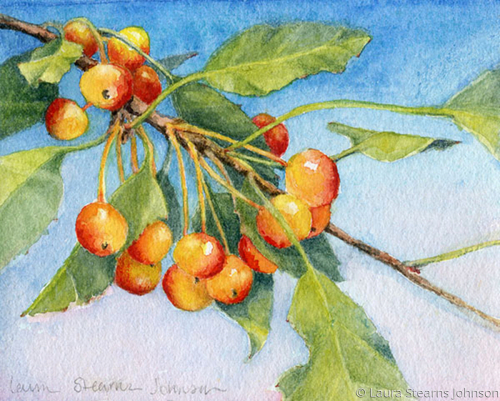 Ah, beautiful, full crabapple branches on a sunny day are a favorite subject of mine to paint. This was a fun, experimental piece. I have two sisters, and I noticed how these flowers are similar, but different from each other, just like all sisters are. 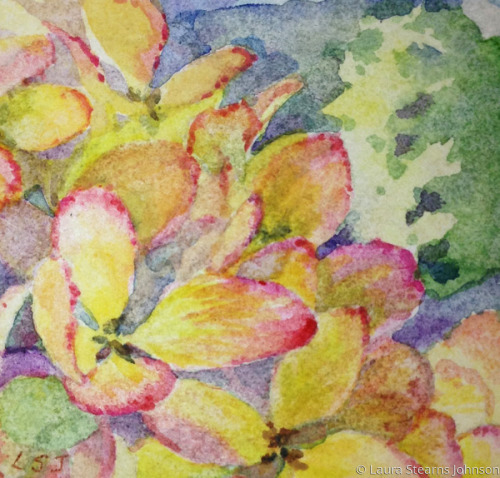 This original watercolor has a white mat and is framed in gold metal. 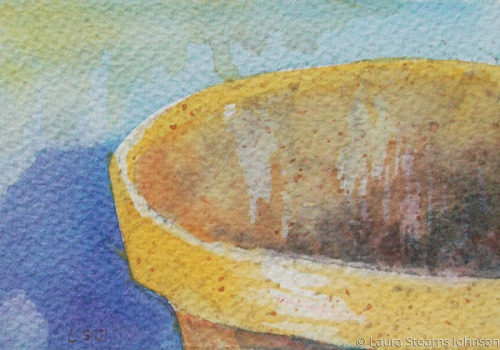 Image size 10 3/4" W x 6" H.
I love how watercolor lends itself so nicely to crockery. Antique crockery bowls are another of my favorite subjects. 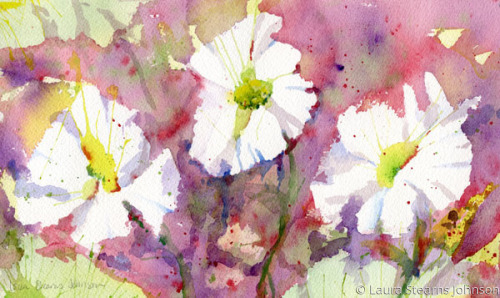 This original watercolor is available with an off-white mat in a gold metal frame. Hydrangeas are one of my favorite flowers. I can get lost in them while painting, and sometimes they make me crazy! 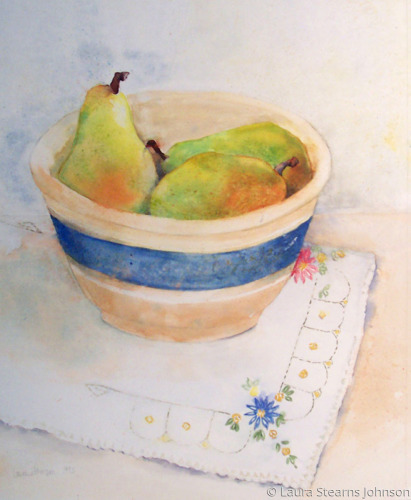 More of my favorite subject matter: pears, crockery and hand-embroidered vintage linens! 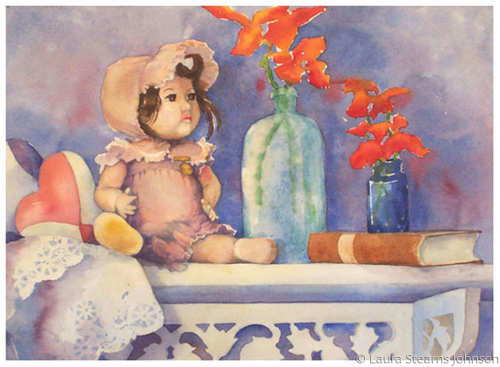 Original watercolor is available with optional off-white mat and cream colored, hand-painted wood frame.